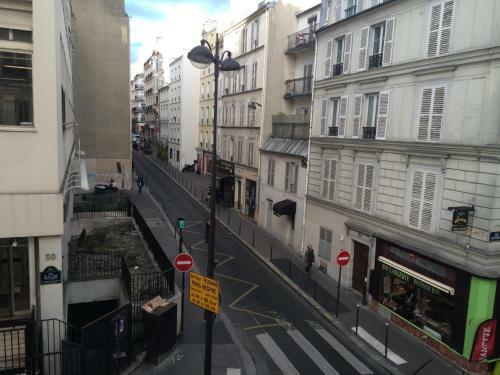 Located in the 9th district of Paris, just a 10-minute walk from Montmartre, Hotel Marena offers a 24-hour reception. Gare du Nord Train Station is 900 metres away and Gare de l’Est Train Station is 1.3 km from the property. All rooms feature a flat-screen TV, desk and wardrobe. They are decorated in a simple style and the private bathroom includes a hairdryer and free toiletries. A breakfast is available each morning at Hotel Marena. Guests can also dine in one of the many restaurants situated in the area. Additional features include free WiFi access in the public areas and luggage storage. Opéra Garnier is a 15-minute walk away and Anvers Metro Station is 500 metres from the hotel, offering direct access to the Champs-Élysées. This room features a flat-screen TV, desk and wardrobe. The private bathroom includes a hairdryer and free toiletries. Rate: € 63.18 ... € 128.76; select dates below to get current rates.